The political climate in Colombia is poisoned. The race for the highest post in Colombian politics is mostly influenced by a person who is not even running, former president Álvaro Uribe. The battle between president-candidate Juan Manuel Santos and Óscar Zuluaga, the puppet of Uribe who is today the arch enemy of Santos, is characterized by dirty campaigning and startling accusations against each other. However, in total there are six candidates in the race (including a non-existing one) to be the next president. This blog post will present all of them. The big majority of Colombians is not excited at all to go to the votes. 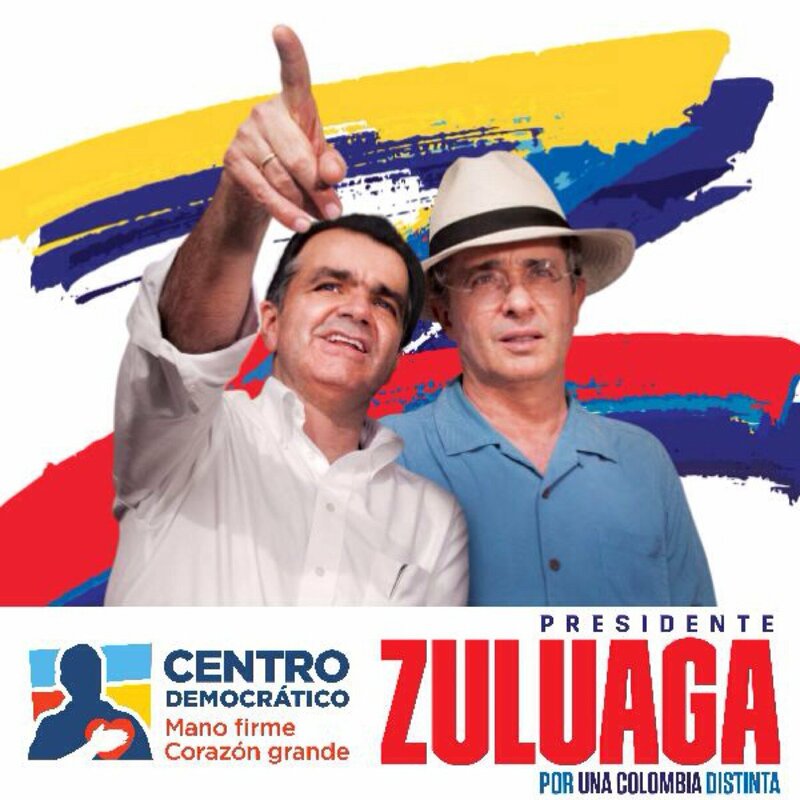 Although the very recent rise of Zuluaga as the main contender of Uribe has made the outcome of the elections very unclear, none of the candidates seem to be very much convincing. Although it is seen as an important exercise to cast the ballot, the choice is not particularly an easy one due to a lack of viable options. The only thing that seems to be certain by now is that a second round on 15 June 2014 will be necessary. López is the candidate of the left, at least those who are still in support of Polo, a party that has been discredited during its time in power in the city of Bogotá with major corruption scandals. She has chosen to run together with Aida Avella, a former leader of the Patriotic Union (UP), a party that was the alternative in Colombia in the late 1980s and early 1990s. As some 4,000-6,000 members were assassinated, the movement was basically wiped out. Now, Avella seems to be very much out of touch with Colombia after almost 20 years in exile in Switzerland. In a classic leftist rhetoric, López promises full employment (which seems a bit utopian in a country with 10% unemployment and one half of the working population in the informal sector). Like the others, she focuses her campaign on education, health, security and infrastructure as well. She also demands right away a ceasefire that the government would need to announce and she would establish a ministry of peace and reconciliation. It seems to be quite surprising that López cannot profit more from the peace talks in Cuba (as president Santos is doing what the left always demanded) and the high inequality in Colombia that has also been characterized by social unrest. In fact, the weakness of the left was already revealed at the parliament elections where Polo only gained 4% of the votes. 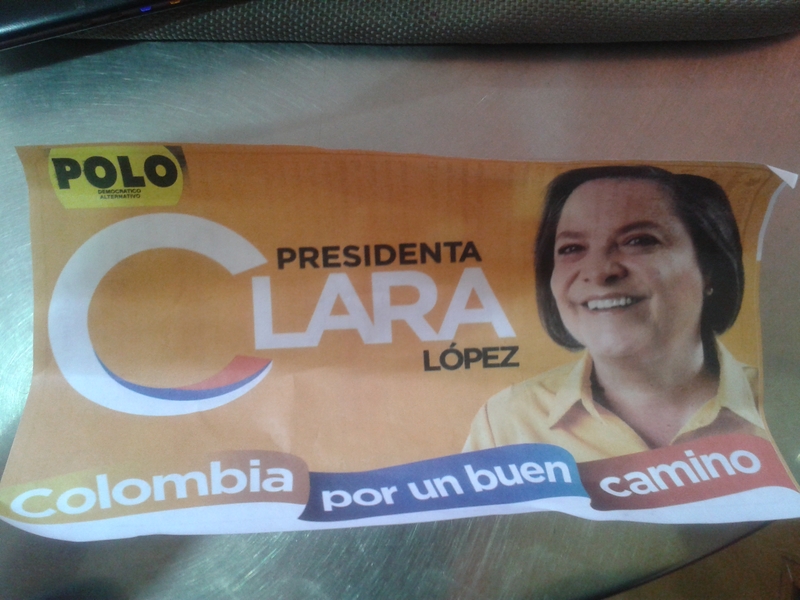 At the beginning, the campaign of López appeared to be rather boring, but lately she has changed her slogan and tried to lift her appearance in a much more juvenile and fresh way. Now, she is portrayed as the woman of hope by her spin doctors. Many of her demands reflect a progressive approach linked to social and economic rights of Colombians. However, the latest mayor from Polo in Bogotá, Samuel Moreno, turned out to be totally corrupt and with him many fellow party members. As a matter of fact, the left lost total credibility and is associated with corruption, mismanagement and the simple inability to run office. 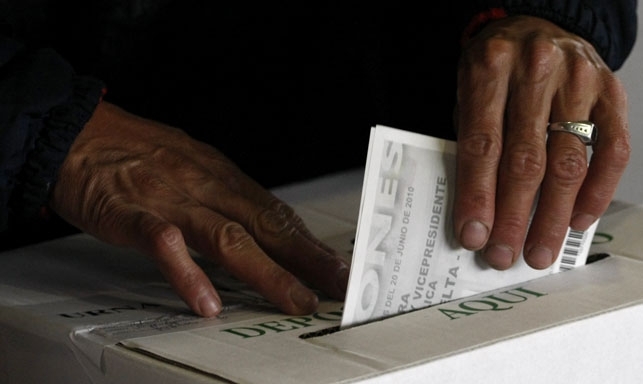 At the beginning of the campaign back in autumn 2013, it seemed that voto en blanco could be a viable option not just for the parliament elections, but also for the presidential elections. Up to a fourth of the votes were predicted at the time could go to none of the candidates. 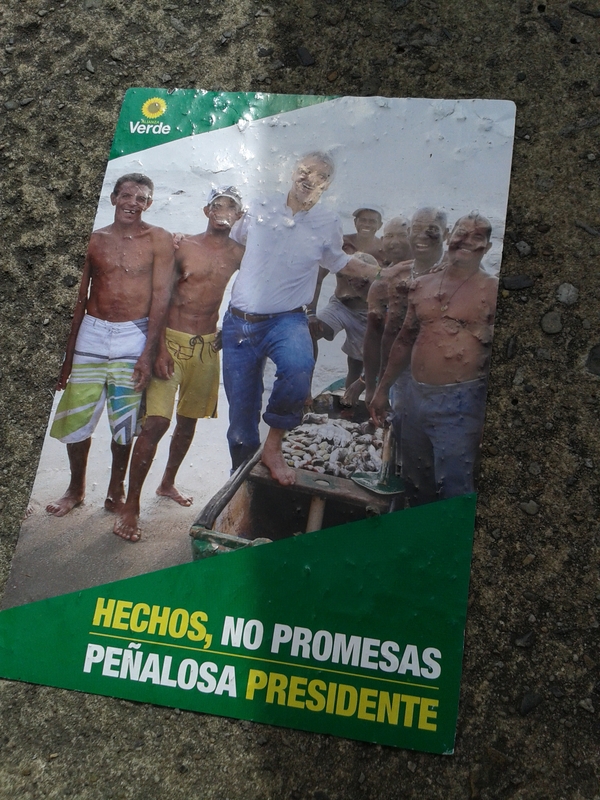 And indeed, many Colombians are quite unsure whom to vote for – particularly those who follow politics closely. None of the candidates seems to have vision, none of the candidates presents the ideas that the country needs and the candidates themselves are corrupt or are surrounded by people who are linked to corruption and mismanagement (like with Clara López). 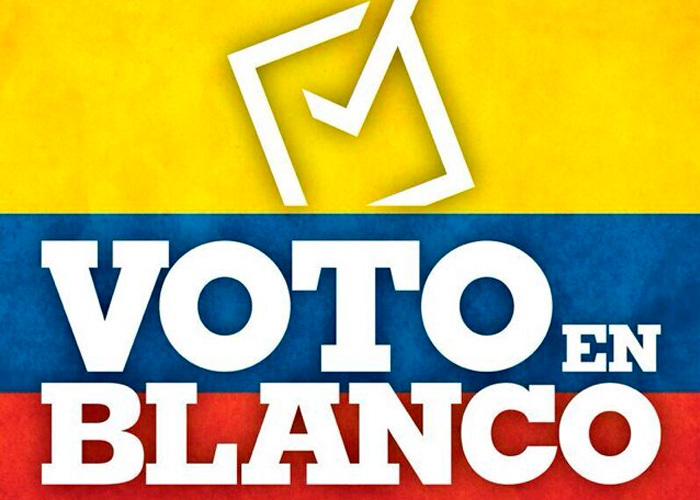 Also the social unrest in the country, particularly from smallholder farmers has helped voto en blanco. For them, also the candidates, who traditionally would stand up for them, particularly from the left, are not a viable option. At the same time, such blank votes will not be that many after all. Too strong are the hints that a white vote is a “lost vote,” because it will help one or the candidate to get into the second round whom one does not want to see in office. After all, these blank votes will suffer from strategic choices. The poodle of Uribe, is successful to play the FARC card. 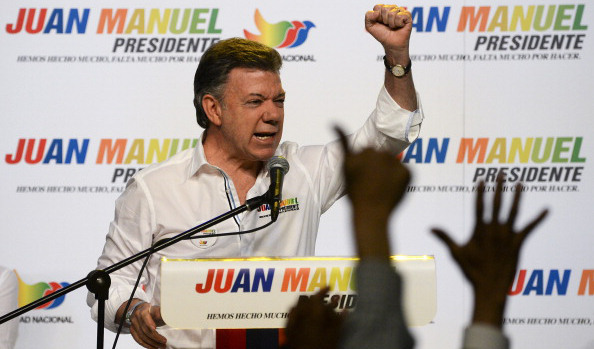 Former president has spread a hatred against the FARC that is hard to imagine from the outside. Despite the fact that a multitude of actors committed terrible crimes over a longer period of time, it is the guerilla that is hated. Crimes of paramilitaries, bacrims and state institutions itself (military and police). Similarly like Uribe, Zuluaga stands for a new nationalism that has not really been known in Colombia in the 20th century. Thus, he would pick up active military campaigns against the FARC to wipe out the guerilla militarily – at whatever cost of human life and democracy. This actually might lead many FARC member to join the bacrim and it would be certainly against the consensus of the international community that a peace treaty is the way forward. Most of the campaign is done by Uribe and not by Santos, linked to the pure fact that Zuluaga is not widely known in the Colombian public although he has been housing minister for two years under Uribe. Zuluaga’s campaign has been shattered though by a big scandal that he used a hacker to get the private emails of president Santos through illegal means and use the information to his favor. Although Zuluaga denies everything and cannot recall a meeting that is one month ago, he is under big pressure that he is using very dirty politics to get to power. His campaign manager had to step down, but the large majority of Colombians most likely will not care about this scandal. On the opposite, Zuluaga declared that Santos received $2mio in 2010 from narco-sources. Although it has been proven wrong, it will play into the hands of Zuluaga (and Uribe) because they damaged the image of Santos. Probably the biggest surprise that president Santos cannot be sure to have a safe ticket for a second term in office. This is mostly linked to what I have described in a recent blog post, where I describe that despite the rather successful talks on Cuba with the FARC and very good economic numbers, the uncharismatic and totally pragmatic Santos will need to go to a second round which he most likely will win because his opponent Zuluaga might not be able to convince enough voters. Thus, most likely Santos will be elected president on 15 June 2014 for a second term in office. Ramírez was nominated again by the Conservatives as their candidate, quite surprising in this otherwise male-dominated party. She already served as Minister of National Defence under Uribe (only the second woman in Latin America to do so at the time). She is a lawyer by training but also focused on economics and finance and received a fellowship from Harvard in 1996. 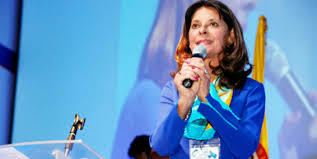 This time around, Ramírez had to use her energy with infights in her own party as a wing refused to support her although she was nominated in a convention. Although, quite surprisingly, she speaks out in favor of gay rights, she is otherwise a staunch conservative and is clearly against abortion. Like Zuluaga, she believes that only through military action the country can achieve peace because she would end the negotiations with the FARC right away. In general, she is just a representation of her grand old party, the Conservatives, that have shaped the history of Colombia ever since the 1840s but is today only a shadow of its former self.